Since its foundation in 2009, Global Marketing Ltd. has been providing specialized services focused on marketing at the point of sale and, more precisely, marketing research related to the consumer habits during the shopping process, the positioning of the products from specific product groups on the regal brands, the implementation of the merchandising and promotional activity in locations geographically covered by the company as well as retail chains. Our mission is to support your business by providing fast, efficient and quality solutions that deliver real results, increased sales and more satisfied customers. We achieve these goals through professionally conducted merchandising services, marketing research and analysis, consulting and, last but not least, personal attitude and constant contact with our partners in the retail chains. Our team consists of highly skilled, young, energetic and innovative professionals with experience in the Fast Moving Consumer Goods (FMCG) sector. 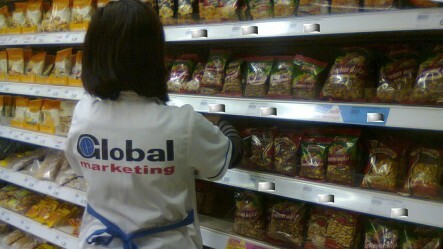 Over 80 merchandisers, as well as a management team take care of the brands serviced by Global Marketing Ltd. The structure of Global Marketing is organized to minimize the costs of our customers and at the same time create the prerequisites for growth of sales, further enhancing the position of the brand at the point of sale. The success of the shop depends directly on the number of purchases, and the purchases are in the hands of the customer – they depend on his needs, mood, and whether the item will attract the customer right away. The site is the place where the customer meets the product and where its choice can be influenced. We are right there. The company provides a structure of supervisors, merchandisers and promoters with rich competencies and working relationships at sites in 37 cities across the country covering all national and some regional retail chains.